Tag line: "It Started as a Concert. It Became a Celebration"
For The Last Waltz, a concert film that chronicles the farewell performance of the rock group The Band, director Martin Scorsese used a few of the tricks he learned while working as an assistant on Woodstock, chief among them being that the more cameras you have pointed at the stage, the more likely you are of capturing every nuance of a live show. Aided by such award-winning cinematographers as Michael Chapman (Taxi Driver, The Fugitive), László Kovács (Easy Rider, Five Easy Pieces), and Vilmos Zsigmond (Close Encounters of the Third Kind, The Deer Hunter), Scorsese took what was essentially a star-studded concert and transformed it into a legendary happening. Tired of life on the road, musicians Levon Helm, Rick Danko, Garth Hudson, Richard Manuel, and Robbie Robertson, also known as The Band, decide to put on one last show, then call it quits. The setting was San Francisco’s Winterland Ballroom, and the date was Thanksgiving Day, 1976. With a little help from their friends (many of whom were musical legends in their own right) , The Band performed 41 tunes over a span of 5 ½ hours. 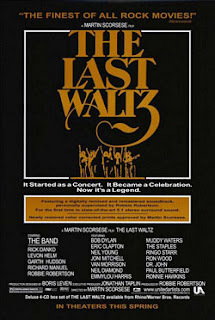 The Last Waltz features some of the highlights of this historic event, as well as “bonus footage”, in which Scorsese interviews the members of The Band, who provide a brief history of the group and explain why they felt it was time to pack it in. While I don’t claim to be The Band’s biggest fan, I do enjoy some of their songs (like Up on Cripple Creek and The Weight), most of which are in the film. But what made The Last Waltz so enjoyable were the celebrity guests who turned up to perform with the group, including Neil Young, Muddy Waters, Joni Mitchell, Eric Clapton, and Bob Dylan. With such a variety of talent on display, The Last Waltz is more than a mere ‘concert film’; it’s one of the best rock and roll movies ever made. When I was a musician, the only time I consciously swiped a chord progression from a song I liked was The Weight. What a great song, and the version here, with The Staple Singers, is the best I've ever heard. My favorite version of Coyote is here, too, btw. I remember when The Band started (under that name) and we thought it was a rather modest name for a band, rather generic. One thing that's made clear right from the start here, though (both from Rick Danko's explanation for the game Cutthroat which opens the film, and from the way they walk on stage) is that they meant they were THE Band.